This book is a mathematically accessible and up-to-date introduction to the tools needed to address modern inference problems in engineering and data science, ideal for graduate students taking courses on statistical inference and detection and estimation, and an invaluable reference for researchers and professionals. 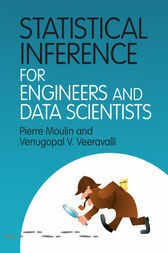 With a wealth of illustrations and examples to explain the key features of the theory and to connect with real-world applications, additional material to explore more advanced concepts, and numerous end-of-chapter problems to test the reader's knowledge, this textbook is the 'go-to' guide for learning about the core principles of statistical inference and its application in engineering and data science. The password-protected solutions manual and the image gallery from the book are available online.